I have previously observed that the National Opinion Research Center’s General Social Survey (GSS) underestimates the rate of gun ownership in the United States. This is a product both of non-response (people who do not answer the “do you own a gun question”) and denial (false negatives) among people who are actually gun owners. Iowa State University political scientist Robert Urbatsch recently published a peer-reviewed article in The Social Science Journal addressing the non-response issue in the GSS data. 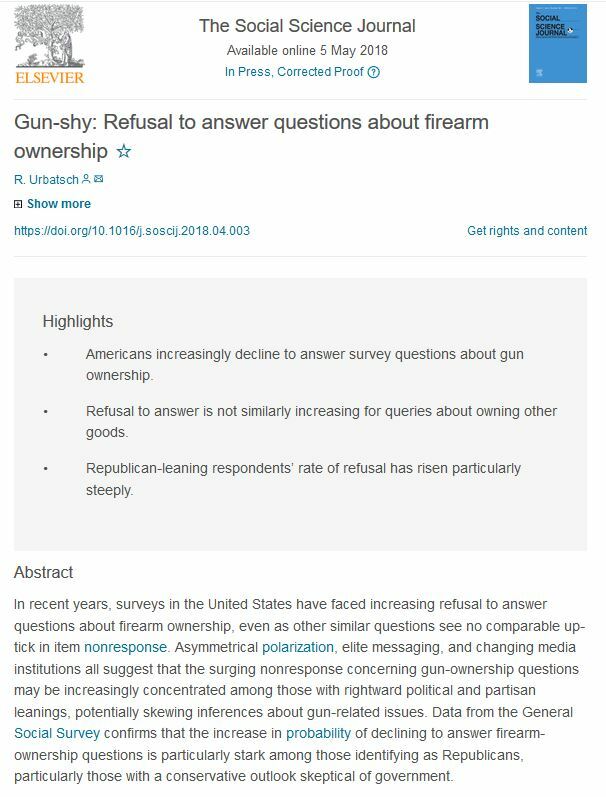 In recent years, surveys in the United States have faced increasing refusal to answer questions about firearm ownership, even as other similar questions see no comparable up-tick in item nonresponse. Asymmetrical polarization, elite messaging, and changing media institutions all suggest that the surging nonresponse concerning gun-ownership questions may be increasingly concentrated among those with rightward political and partisan leanings, potentially skewing inferences about gun-related issues. Data from the General Social Survey confirms that the increase in probability of declining to answer firearm-ownership questions is particularly stark among those identifying as Republicans, particularly those with a conservative outlook skeptical of government. Among other findings, Urbatsch documents that Republicans, who are particularly likely to own firearms relative to Democrats and Independents, are also particularly likely to refuse to respond to the GSS gun ownership question. Fig. 2. Refusals to answer General Social Survey questions about gun ownership, by political party. Squares show refusals among Democrats, circles among independents, and diamonds among Republicans. I do not take this to be a blanket indictment of the General Social Survey. I have used GSS data for 25 years. No data is perfect. But this systematic under-representation of gun ownership in the GSS is significant because their (in my opinion low) rate of ownership is often used politically to suggest that gun owners are becoming a smaller and hence more marginal demographic in American society. And Urbatsch’s study does not speak to the issue of false negatives — those who own guns who claim that they do not — which is very hard to document empirically. It is also possible that there are false positives — those who do not own guns but claim they do — but I do not think people are as strongly motivated to falsely claim ownership as to falsely deny it. Tags: Data, General Social Survey, Gun Ownership. Bookmark the permalink. I think I shared the one empirical test of false negatives I had found, the midwestern (MI? WI?) state survey of firearm and hunting licensees, which found a 10% denial rate. But I’d have to look for it again. My apologies if you did share I do not recall it! As a family we have always been closed-mouthed about firearms we might own, on the principle that it’s none of anyone else’s business, and because not everyone who would have access to that data has our best interests at heart. This hoplofobia site is on top of things, posting the pre-print edition back in 2017!